Why do I continue to look for the perfect curriculum? To me it is like the brass ring on a merry-go-round. I can’t seem to stop reaching for it! I know that each curriculum has its pros and cons. Even in my philosophy of education, I believe that no one curriculum is right for everyone. So why am I still looking!?!? Recently, we have found the free home curriculum Easy Peasy over at http://www.allinonehomeschool.com. And you know, I really like it. We have been using it for three weeks now and it seems to fit really well into what we are doing. Now, as we go, Builder needs to move on in math. Princess needs to skip a whole week! Yeesh. And I find myself doing the eclectic thing by bringing in the science, spelling, and handwriting that I want and feel is right for Builder. I need to remind myself that truly, I know what is right for my kids. Deep down, I know if they are challenged, bored, or struggling. I know if they need to move on, slow down, or speed up. Or even, just take a break. It is ok, to pull in this, push out that, and start over again if need be. It’s ok to jump full force into a sunny day and play outside or go to the park instead of getting all tasks done. And vice versa, it’s ok on a sunny day to get done what we need to. In point, this schooling at home thing is far more fluid than what I am used to and comfortable with. The lessons I learn each and everyday, match or far exceed what my kiddos are learning. Or maybe, just maybe, they are learning with me and from my mistakes and successes. Lord, lead me, lead them, lead us. On a lighter note, springtime is on us in full force. So, to go along with that oh so sweet sound of rain, we are giving our hands a try at making our own raindrop display. I’m thinking this may spin off into a full blown water cycle unit. We shall see. Find a handful of blue crayons. They can be all the same blue, or different shades of blue. Peel the papers (great fine-motor skill). Sharpen crayons over a medium to large piece of wax paper. Until the wax paper has a good sprinkling of wax shavings. Place an equal size piece of wax paper on top and iron on the lowest setting. It only takes a quick moment to melt wax. Let cool. Draw raindrop shapes on the wax paper and cut. 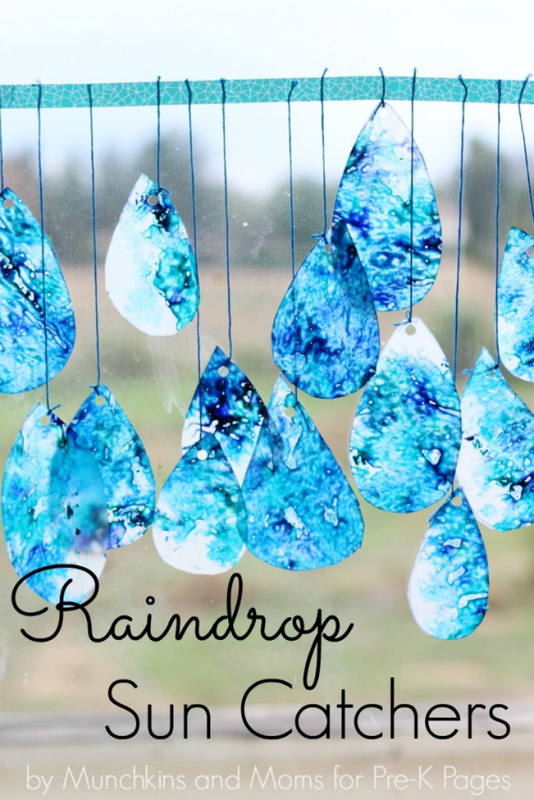 Use a hole punch and string to tie onto your raindrops and display. I will update with pictures once our raindrops are proudly displayed. I can’t wait to see how they turn out!